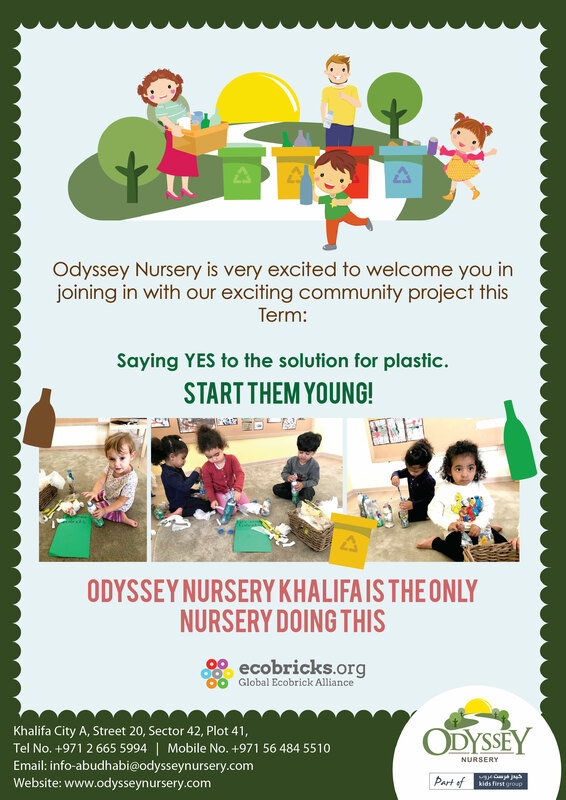 Odyssey Nursery Khalifa is very excited to invite you to join us in our exciting community project to this Term. Saying YES to the solution for plastic. We are the only nursery doing this! START THEM YOUNG! Support us by dropping off their plastics in the nursery and we will make it re-usable. Let's give back to mother earth. For more details, check out our flyer. Come and experience the largest outdoor facilities this winter break at Odyssey Khalifa branch! 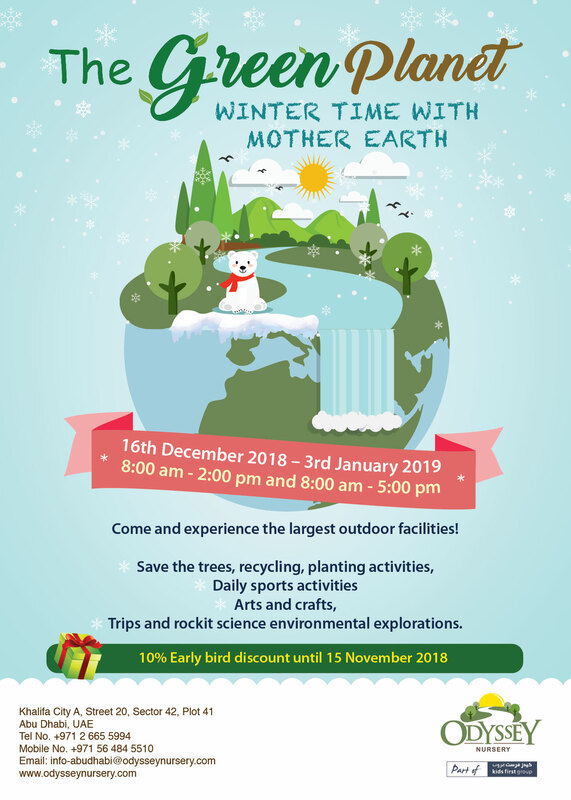 Save the trees, recycling, planing activities, daily sports activities, arts and crafts, trips and Rockit science enrvironmental explorations!!! Register today and get special discounts. Odyssey Nursery Khalifa City Branch is happy to announce our first Coffee Morning on Sunday, October 14, 2018 from 9:30- 11:00 am at the nursery. 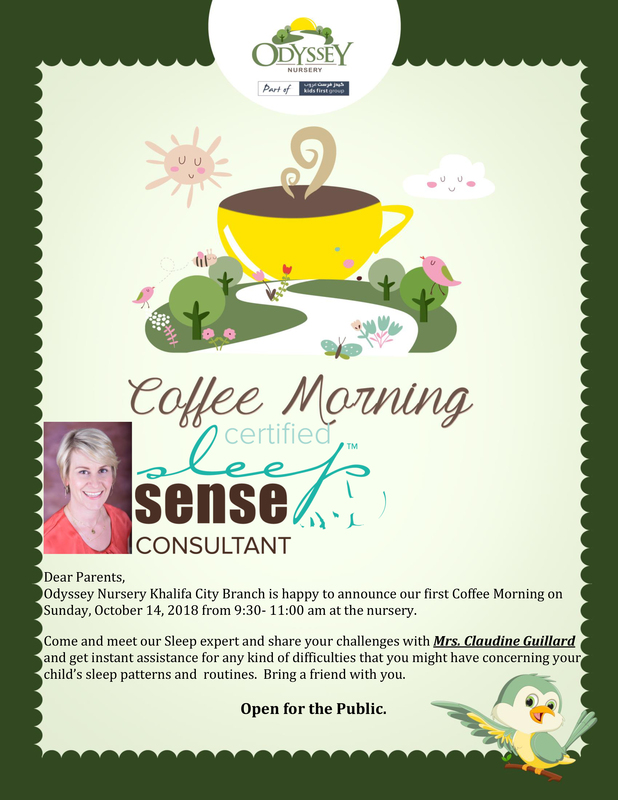 Come and meet our Sleep expert and share your challenges with Mrs. Claudine Guillard and get instant assistance for any kind of difficulties that you might have concerning your child’s sleep patterns and routines. Bring a friend with you. Open to public. Free admission. 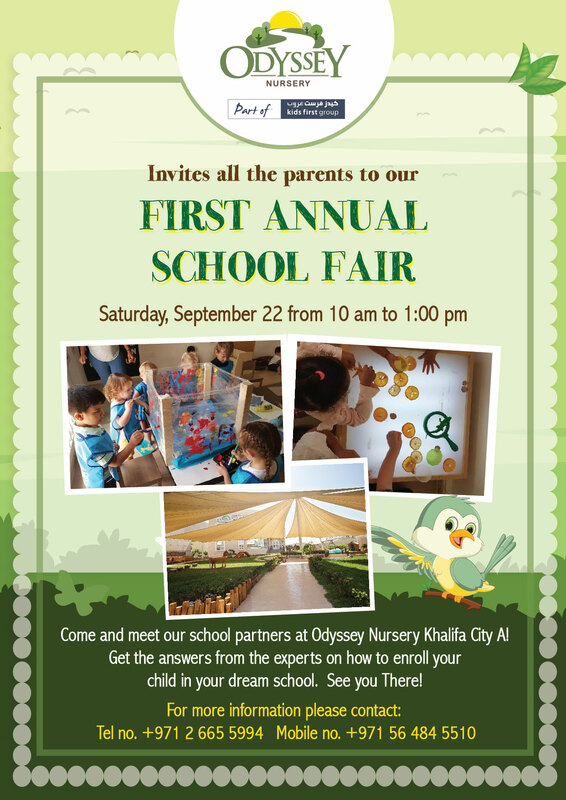 Odyssey Nursery Khalifa City A is inviting everyone to participate in our 1st Annual School Fair! Come and meet our school partners and get the answers from the experts on how to enroll your child in your dream school. See you all there! Odyssey Nursery Khalifa would like to thank all the schools for participating in our First Annual School Fair. Parents were delighted to have their queries answered and began the process of FS1 and 2 enrollment. Best of luck to all! Check out our Gallery for photos of the event. Come and meet your child's teachers, nursery and get to know: - Leela's lunches representatives - Our physician Dr. Lina - Brighton College representatives and many more surprises!!! See you! Each week, a new theme is used, designed for your child’s education and entertainment. On the first week of camp, the theme will be Little Picassos; the second week is all about culinary creations; the third week is designed for the animal lovers. 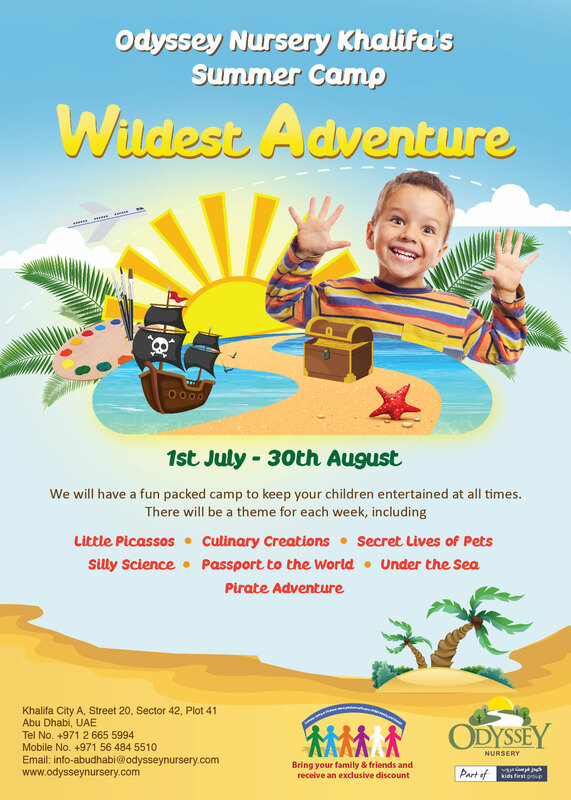 The rest of the summer camp also has unique themes ready for your child to enjoy! Join us on June 5th as we celebrate International Environment Day with all the children, staff and parents! The entire month of June will be about recycling and environmentally-friendly behavior; and at the end, we’re having a fashion show! 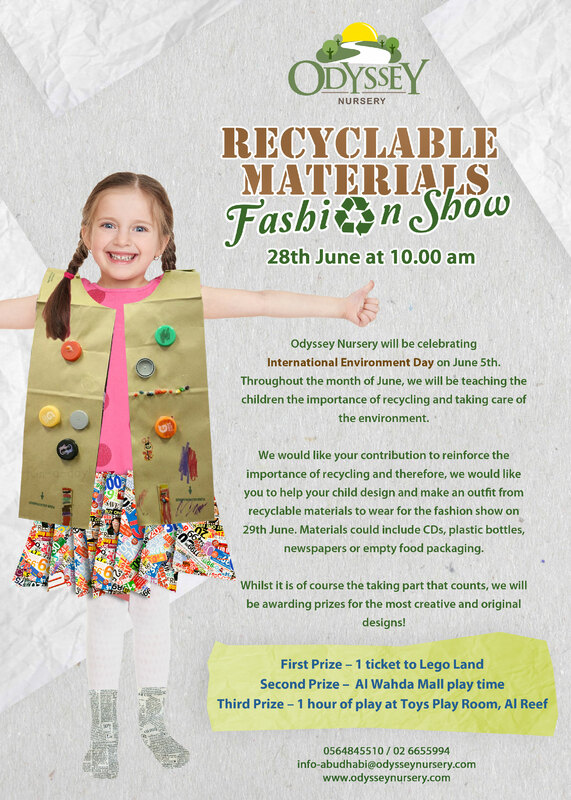 Help your little one design an outfit made entirely of recycled materials and you could win exciting prizes! Not only do we make sure our environment is warm and friendly, our facilities are unique in that they allow kids to reach their full potential. 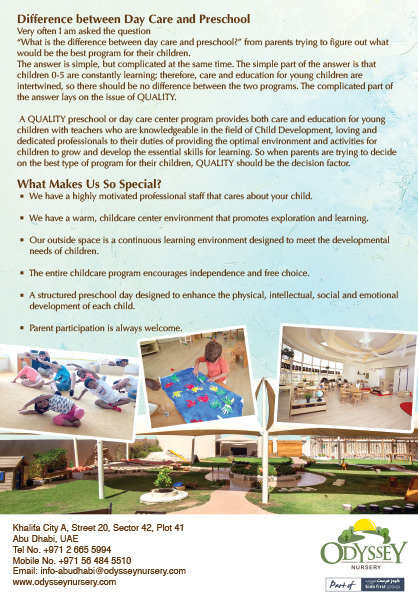 Our program is especially made to build your little one’s confidence and improve their cognitive, social, emotional and physical development. Most importantly, we involve parents in every step of the way! Read our leaflet to know more. Spring break is right around the corner, and you’ve got to work. Don’t worry! 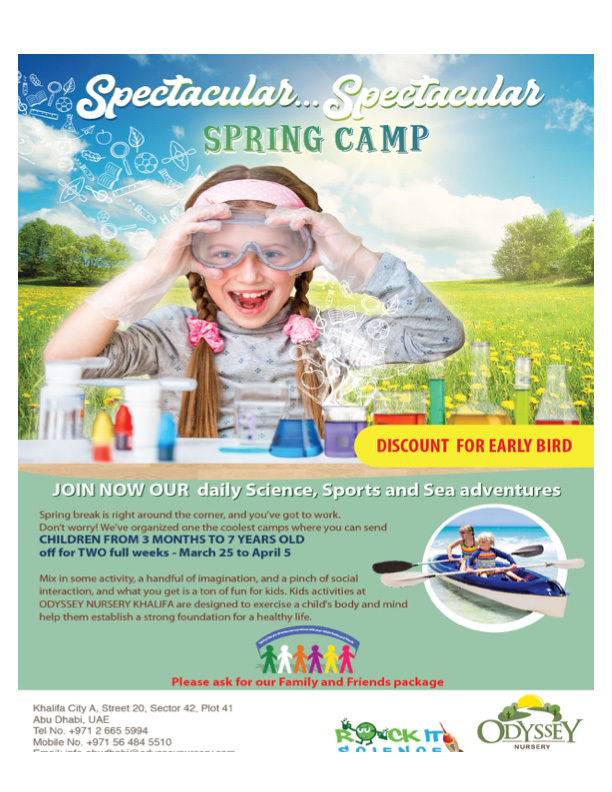 We’ve organized one the coolest camps where you can send CHILDREN Off for TWO full weeks - March 25 to April 5 Mix in some activity, a handful of imagination, and a pinch of social interaction, and what you get is a ton of fun for kids. 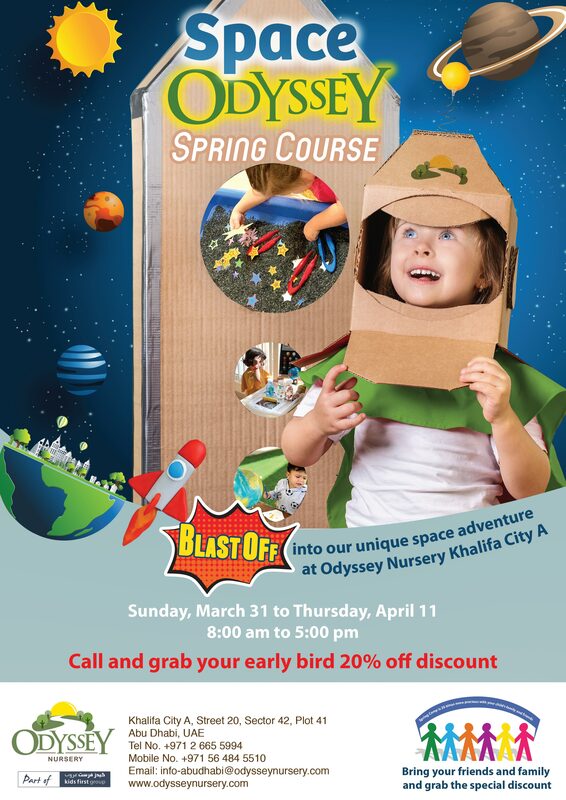 Kids activities at ODYSSEY NURSERY KHALIFA are designed to exercise a child's body and mind to help them establish a strong foundation for a healthy life. Click here to enroll them now.